1. Great Smoky Mountains National Park: The Great Smoky Mountains National Park is a world-renowned preserve of wildflower diversity—over 1,660 kinds of flowering plants are found in the park, more than in any other North American national park. In fact, the park is sometimes referred to as the “Wildflower National Park.” From the earliest hepaticas and spring-beauties in the late winter to the last asters in the late fall, blooming flowers can be found year-round in the park. 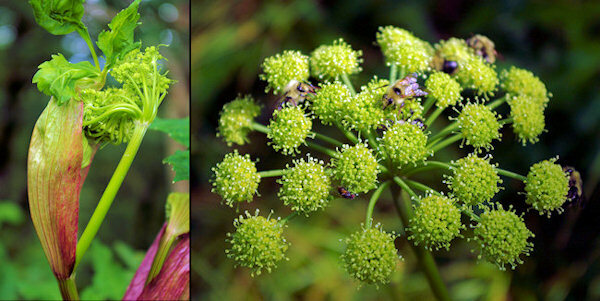 A group of flowers known as spring ephemerals begins the yearly show. Ephemerals are so named because they appear above ground only in late winter and early spring, then flower, fruit, and die back within a short two month period. 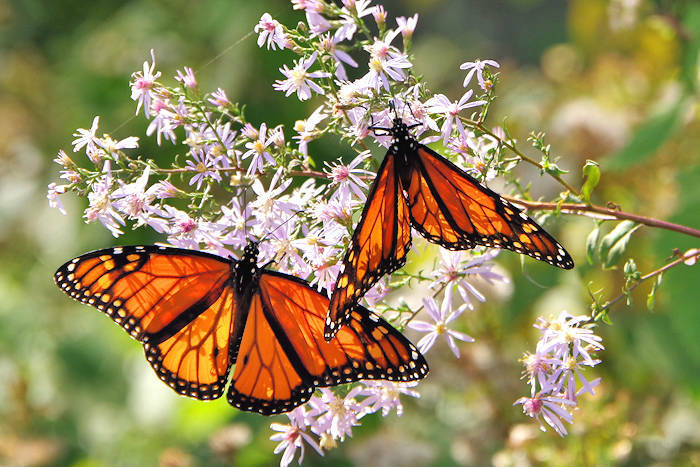 They emerge from February through April, and are gone (dormant) by May or June. This remarkable group of plants is adapted to the rhythm of the overstory trees. 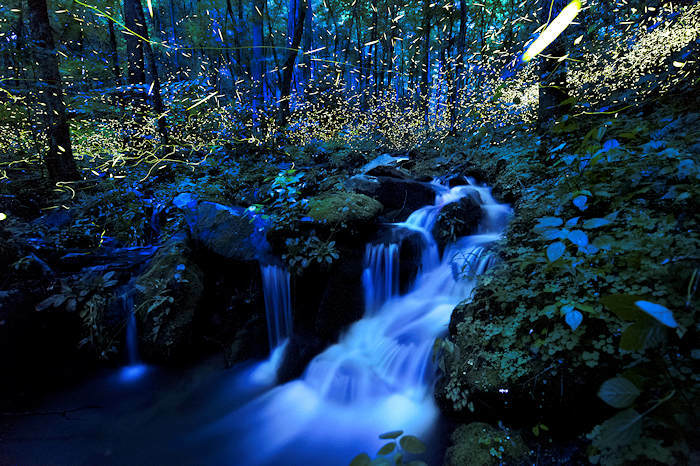 Ephemerals appear before deciduous trees leaf out, when full sunlight is streaming to the forest floor. This is also a time when soil moisture is high and soil nutrients are plentiful due to the decomposition of tree leaves that fell the previous autumn. The ephemerals exploit these conditions—they flower, fruit, and their above-ground parts decay before summer gets into full swing. The peak of spring wildflower blooming usually occurs in mid- to late-April at lower elevations in the park, and a few weeks later on the highest peaks. 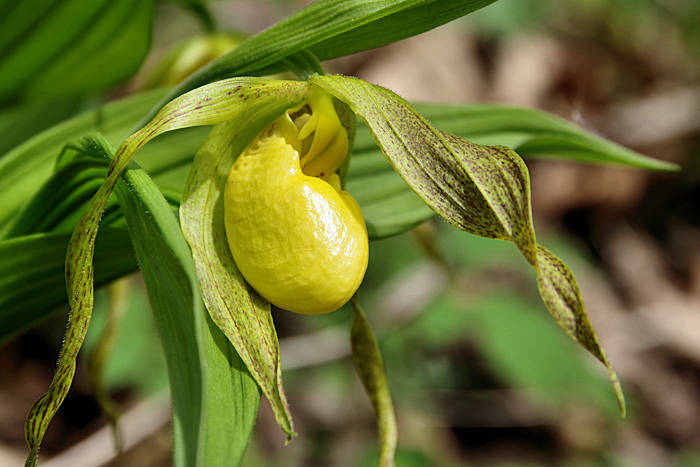 Spring ephemerals include flowers such as trillium (the park has 10 different species), lady slipper orchids, showy orchis, crested dwarf iris, fire pink, columbine, bleeding heart, phacelia, jack-in-the-pulpit, little brown jugs, and violets, to name just a few. 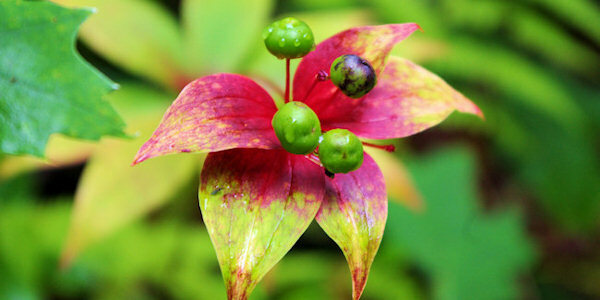 For a great wildflower walk, take the Oconaluftee River Trail, an easy, three mile roundtrip, riverside walk begins at Oconaluftee Visitor Center located two miles north of Cherokee, NC on US-441. 2. Botanical Gardens of Asheville: Just a mile from downtown Asheville are the wildflowers of the Botanical Gardens at Asheville, focusing on plants native to these Southern Appalachian Mountain areas. 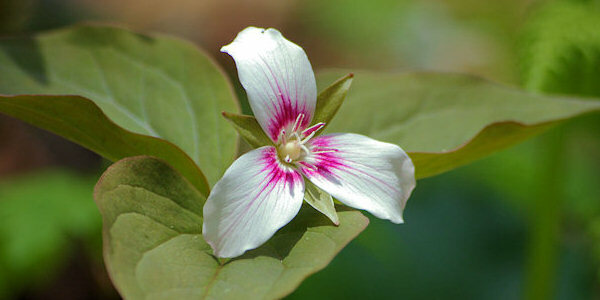 Although the peak wildflower season is April to mid-May, something flowers nearly all year long. In summer, you’ll find berries and the blooms of the Goldenrods. Fall brings out the many varieties of Asters and Eupatorium.. Winter, too, is not forgotten as the Witch Hazel's blossom is like a spent New Year's party favor. 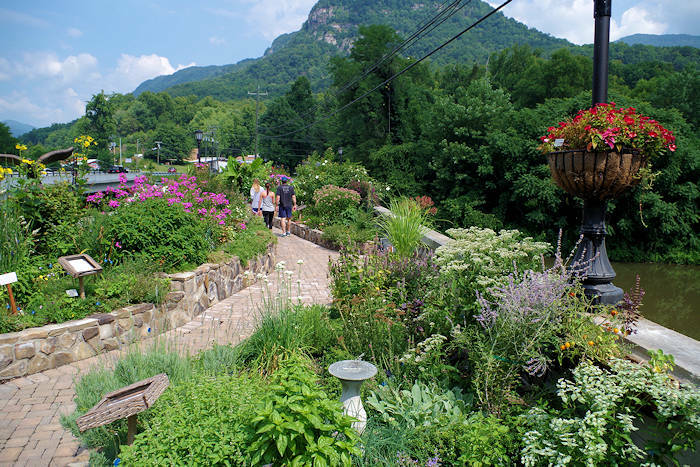 Within the ten acres that comprise the Gardens, a walking trail forming a half-mile loop leads visitors across bridges spanning streams, through meadows, and over a woodland ridge to a wildflower cove. An authentic “dog trot” cabin and a spring house demonstrate how our ancestors lived, and a lovely gazebo provides shelter in the midst of the Sunshine Meadow. 3. Blue Ridge Parkway: The diversity of wildflowers on the Blue Ridge Parkway is truly amazing. Blooming starts in late March and extends through October, rewarding visitors to the park with a wide variety of floral displays ranging from the small and delicate to the large and showy. The high rainfall, rich soils, varied topography, and moderate climate provide an environment where many species can coexist together. Of the approximately 1,600 species of vascular plants that occur in the park, as much as 80 percent are wildflowers. The single best time of the year to see many species in bloom is early spring, just as canopy trees are beginning to leaf out (late April – early May depending on elevation). The forest floor is covered with numerous plants in bloom, such as Chickweed, Wild Ginger, Liverleaf, Toothwort, Spring Beauty, Trout Lily, Trillium, Larkspur, Foamflower, and Jack-in-the-pulpit. 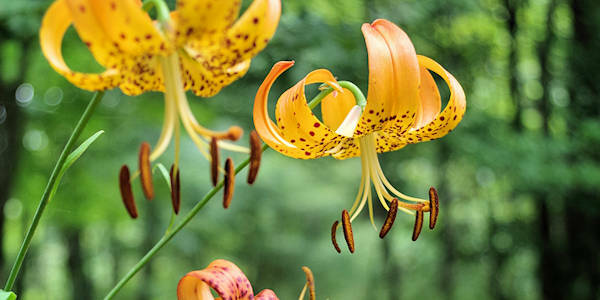 Later in the season other species such as Turk’s Cap Lily, Meadow Rue, Evening Primrose, Bellflower, Bee Balm, Impatiens, and Turtlehead are in bloom. Even later, species such as Goldenrod, Aster, Blazing Star, and Black-eyed Susan’s will bloom. 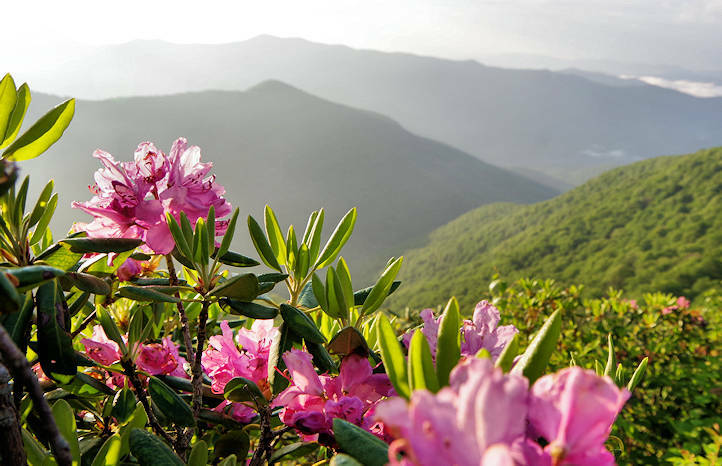 Favorite stops for wildflowers along the way are Graveyard Fields and Craggy Gardens. 4. NC Arboretum: The North Carolina Arboretum celebrates the botanical richness of the Southern Appalachians by sharing our blooming treasures with you. Staff and volunteers take regular inventories of the species of native plants that we have on our property. 6. 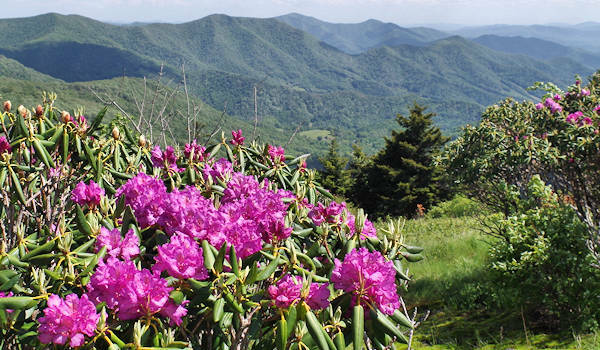 Roan Mountain: This 6,285-foot ridge straddling the North Carolina and Tennessee State line is famous for natural gardens filled with a potpourri of wildflowers and rare plants. The show stopper here is the Catawba rhododendron. The mountain's treeless areas, called "balds," offer panoramic views across a sweeping flow of grasses. Carpeted in thickets of rhododendron, the gardens are flooded with thousands of pink and lavender blossoms in late June. The garden's trail winds around this natural wonder, taking visitors to a platform that over looks a sea of rhododendron and the valley. Read more about Roan Mountain.